These discs may be appearing on the super-cheap Brilliant Classics label, but this release is nevertheless of considerable significance. Perhaps not quite the ground-breaking achievement it was for Dorati and the Philharmonia Hungarica back in the 1970s with their first ever recording of the complete Haydn symphonies for Decca (reissued on CD in 1991 on Decca 430 100-2DM32 - 32 discs), but a newsworthy event nevertheless. These 33 CDs of the 107 symphonies (a word about the precise number shortly�) were recorded over a period of 14 years by a hand-picked ensemble of musicians from Vienna and Budapest, in no less a venue than the Esterházy Palace itself. By any standards, this was a huge undertaking and, with this release, it is now finished. Congratulations and celebrations are in order! Various symphonies were available at one time or another in alternative couplings. There was a two-CD set of �great� Haydn symphonies: N17041/2. Also, a selection of the so-called �Stürm und Drang� middle-period symphonies: N17072/3. And a further single-disc issue including (as the well as two of the Violin Concertos) the Sinfonia Concertante, Hob.I:105, which Haydn wrote for his first London visit in 1792: N15518. A number of other combinations were also issued singly alongside the boxed sets, but none of these has been available for some time now. Nimbus was taken over by Carlton Communications in June 1998 and went bankrupt in December 2001, with just one of the eight volumes remaining to be published. Fortunately, that final volume (it was to have been Volume 2) had already been taped. This last group of symphonies (comprising Nos 21-39, and the youthful �orchestral� versions of two Op 2 string quartets which Robbins Landon dubbed 'A' and 'B') were mostly recorded in June 2000 and April-May 2001. Volume 2 would have included some items dating from the earliest years of the project: Nos 22 and 24, for example, were taped as long ago as April 1989, but these were available until recently (coupled with No 45) on a separate single-CD release. With the exception of Nos 22 and 24, therefore, Nos 21-39 all appear (along with 'A' and 'B') for the first time in this Brilliant Classics boxed set. The Dorati set is technically even more complete, as it includes alternative versions of various pieces. Unlike Fischer, Dorati offers No 22 in E flat major �The Philosopher� in both of Haydn�s �orchestrations�, giving you a choice of flutes or cors anglais; you get all three alternatives finales to No 53 in D major �L�Impériale�; also the original extended finale to No 103 in E flat major �Drumroll�. Fischer gives all these a miss: whether this matters is up to the individual purchaser. The mixing of �old� and new recordings in this current package is inevitably reflected in the music too: Hoboken�s numbering sequence is largely chronological, but far from invariably so. (Some of the dates I�ve given are still shrouded in uncertainty: in the case of some of the early symphonies in particular, we can be aware of the first known dates, but not necessarily their dates of actual composition. For example, No 26 � one of the magnificent soul-searching symphonies of 1772, along with Nos 43-47 � was in fact written some nine years after No 59!) Even so, the decision to go for a strictly numerical sequence is a logical one: it makes for speedy access, it gives us combinations which are far more often satisfying than repetitive, and (should you ever be uncertain) it means you can quickly verify the identity of the symphony you�re listening to simply by glancing at the index number display. An encyclopedic survey such as this will inevitably be regarded by would-be purchasers as a kind of historical document, and one might reasonably expect it therefore to be authoritative. This in turn might lead us to anticipate readings which are straight-forward, honest, and devoid of �interpretation� in the sense of superimposing the conductor�s ideas over the composer�s. But Fischer�s recordings are in fact full of individuality. The texts are urtext, but the conductor is forever adding (albeit discreetly) cheeky gracenotes and elegant ornaments; changing or varying articulation; manipulating tempo with a subtle rubato; and (commonly, especially in repeated sections) using solo strings instead of tutti. He is quite happy to invent dynamic marks where none (or too few) exist in the score: the contrapuntal finale of No 70 in D major, for example, where Haydn gives absolutely no guidance on such matters for several pages on end. And he obviously relishes those playful meanderings in the late sonata-rondo finales where, after venturing down an episodic cul de sac, Haydn �looks� for the theme: there�s an infectious sense of fun at these always-memorable moments. The �presence� of the conductor becomes increasingly evident throughout the project, and some of the latest recordings (especially those not previously issued) contain a number of unauthenticated (albeit musical) dynamic shadings, some of which are so marked that one or two listeners may find them excessive. Comparing the two G minor symphonies � No 83, recorded in 1991, with No 39, recorded in the final sessions in May 2001 � reveals a transition from being a loyal and faithful interpreter (in No 83) to what some might regard as being dangerously intrusive: witness the rather heady up-and-down hairpins in the opening of No 39. At best, Fischer�s individuality has the effect of heightening our involvement. The syncopated rhythms in the first movement of No 26 in D minor �Lamentatione�, for example, create a very real urgency, the repeating notes at the end of the opening subject being delivered with an almost Bartókian martellato. And yet the following slow movement is intimately prayerful, and the naked string tone of the closing minuet suits its penitential character to perfection. All this adds up to music-making on an almost Mahlerian emotional scale: you may love it, but you may well not. In the accompanying booklet, Fischer talks of a �vernacular� idiom with which his Viennese and Hungarian players are familiar, and mentions the particular example (Der aufstampfende Auftakt) of "a rustic ritardando in the upbeat followed by a slightly delayed first beat with a heavy accent, mostly used in minuets". All the evidence is that he and his players became increasingly confident in engaging with this kind of rhythmic liberty as the project progressed. Although barely noticeable in the minuet of No 100 in G major (though it�s a perfect candidate, you might argue), it is adopted to absolutely thrilling effect in the minuet of No 50 in C major, where the weight of horns, trumpets and timpani lifts you out of your seat: seven years separate these recordings. Fischer�s essay also sets out his case for using modern (rather than �original� or �period�) instruments: but his approach needs no apology or explanation. Vibrato is used minimally, and open strings resonate frequently: just listen to the minuet of No 28 in A major! And winds and brasses sound appropriately rustic where the music demands or suggests it: the horns� dotted rhythms in the opening bars of No 47 in G major, for example, are brazen enough to sound like true corni da caccia! The orchestral playing is of an exceptionally high standard throughout the series: with players from the Vienna Philharmonic, Vienna Symphony and Hungarian State Symphony Orchestras, you�d expect it to be so. It seems churlish to single out individual players, but the principal oboist (Harald Hörth, of the Vienna Symphony Orchestra) gives untold pleasure every time he puts his instrument to his mouth: try the delightful trio of the minuet in No 38 in C major, or its gorgeously hyperactive finale! And the double-bassist (Franz Bauer, whom we hear several times as soloist, especially in the �Matin-Midi-Soir� trilogy) is supremely musical. On the other hand, the high tessitura of some solo violin passagework isn�t always completely secure: I�m afraid this includes the late Sinfonia Concertante. Brass parts in classical symphonies are famously dull: or that�s what you might have been led to believe if you speak with horn and trumpet players who haven�t played early Haydn. In fact, there�s a wealth of attractively wide-ranging (mostly high-lying) melodic detail in this repertory, and it can be extremely taxing even for today�s musicians. I take my hat off to Fischer�s horn players: their ornamental quartet (led by Martin Bramböck, formerly of the Vienna Volksoper Orchestra) in the closing variation-movement of No 31 in D major �Hornsignal� is a joy to hear, and their intoning of the slow movement theme of No 51 in B flat major (first player up to super-high A flat above the treble clef, concert pitch; his colleague answering down to F an octave and a bit below the bass staff, concert pitch � well into contra-bassoon range) is spectacularly assured! Even when Haydn requires his horns merely to intone harmonic semibreves (as is � inevitably � so often the case with such simple instruments), Fischer commonly has them adopt Beethovenian sforzandi to make the best of their tonal weight and brilliance � judiciously, so as not to disturb the fragile orchestral balance: the most recent recordings in particular are anything but tame performances! There�s a tangible sense of enjoyment � almost a holiday atmosphere � in many of these recordings, which is never more noticeable than in their �telling� of Haydn�s jokes. (These symphonies are riddled with comic effects, varying from silly tricks such as false or wrong-key recapitulations, to rude noises, surprise outbursts and holdings-up of the expected!) Some of Haydn�s outrageous silences are extended, so tripping up even those of us who �know� the silences. In the slow movement of No 93 in D major, the bassoon fart (I hope the editor will allow me this one, as this is � demonstrably! � Haydn�s intention) is a filthy noise, and not merely a finely-honed unison bottom C, as in so many recordings. Not quite so crude are the coarse bagpipe-like drones in the trio of the minuet in No 88 in G major, where these top-flight musicians temporarily transform themselves into rough-hewn peasant bandsmen. When it comes to the ridiculously repetitive quavers in the slow movement of No 83 in G minor (which seem to go on for ever, with no sign of anything happening), Fischer has his players decresendo to near-inaudibility, rendering the subsequent fortissimo a well-intentioned shock: I�m sure Haydn would have laughed out loud at this one! Despite my admiration of Fischer�s musicians, I have to say there is quite a lot of (momentarily) untidy ensemble. Needless to say, this isn�t incompetence or inexperience but, rather, the kind of thing which would have sorted itself out with a minute�s additional rehearsal, or just another take. I wonder how much pressure there was on studio time? Fischer�s (or someone�s) inhaling and shuffling is occasionally distracting, and there are at least two instances (the Andante of No 4 in D major, and the slow introduction to No 102 in B flat major) of sudden noises in the background which really ought to have been edited out. Also, in the slow introduction to No 99 in E flat major, the tempo suddenly quickens after the halfway pause: as this makes no musical sense, I can only assume that two very different takes have been carelessly joined. The Haydnsaal in the Esterházy Palace offers a resonant acoustic which the Nimbus engineers seem to have found (certainly initially) troublesome. The 1987-89 recordings are slightly boomy and fuzzy. However, in the later sessions � from 1990 onwards � the sound is clearer, the reverberation altogether better-controlled: and, fortunately, none of the colour, weight and bloom (which distinguish the whole series) is sacrificed. Make no mistake: the �Paris� and �London� symphonies receive admirable performances � affectionate, intelligent, well-played and, with few exceptions, comparing favourably with any in the catalogue. My pick of these would be No 99 in E flat, perhaps the most orchestrally rich and ambitious of all, where Fischer�s orchestra glows like a polished diamond, and sings from the heart. But, as I have said, the later sessions (mostly the earlier symphonies, including the so-called �Stürm und Drang� symphonies) are better still, with cleaner and brighter sound, more orchestral polish, and abundant range and energy: they�re littered with personal touches which, far from being obtrusive, are a constant delight. No 44 in E minor, for example, the desperately urgent first movement of which contrasts with its divinely beautiful slow movement � the one Haydn asked to be played at his funeral. I haven�t the slightest hesitation in declaring this last instalment (of Nos 21, 23, 26, 28-39, 'A' and 'B') the best so far. It leaves me wishing the team could revisit their earliest sessions: I�m sure � given the quality of today�s Austro-Hungarian Haydn Orchestra and Fischer�s new-found �daring� as an interpreter � that some re-recorded �London� symphonies would have been impressive indeed. The CD booklet is a good read � user-friendly rather than academic, but with only limited information about particular symphonies or musicians. I would strongly recommend a visit (purchase or no purchase) to http://haydnphil.org/, the official Fan Club of Fischer and his orchestra, which is a mine of fascinating information. These days, there are innumerable options when it comes to collecting Haydn symphonies on CD. Dorati (on Decca) and Fischer (here, on Brilliant Classics) are complete, both using modern instruments. Goodman (on Hyperion), Hogwood (on L�Oiseau Lyre) and Pinnock (on DG Archive) � all using �original� instruments � are well on the way. The ever-enterprising Naxos label has already released has a considerable number of discs in its on-going project: these are shared between Wordsworth, Müller-Brühl, Drahos and Ward. Marriner and Brüggen (both on Philips) and Kuijken (on Virgin) have recorded many if not most of the better-known pieces. All of these recordings, in their very different ways, can be confidently recommended. When it comes to the �London� series, you�re positively spoilt for choice: for me, Davis leads the field with his immaculately played (the Concertgebouw) and deeply affecting readings on Philips Duo. Fischer�s has been a memorable project: it began well, and got better and better. In the early days, it was competitive without ever being top of the class: now the race is run, it is most certainly a winner, and its rivals have their work cut out to match it, let alone surpass it. Reviewing this 33-CD box has been something of a marathon for me: for 10 (happy!) days, I�ve listened to nothing but Haydn symphonies: and what live-loving, live-giving, life-enhancing music it is! Of course it took Fischer all of 14 years, and Haydn himself no less than 38: but I suspect they were equally happy assignments for them also � indeed, you only have to listen to know that that must have been so! As Haydn himself would have said: Laus Deo! 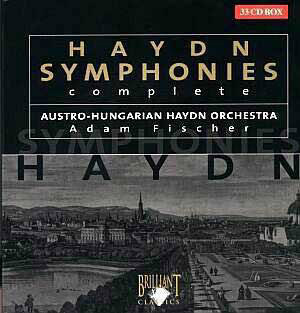 In Peter J. Lawson's review of the complete Haydn Symphonies conducted by Adam Fischer he says that Nimbus Volume 2 was never released. This is not quite true. I am in the United States. Here the set was released albeit probably in a limited fashion. It was available briefly I think at Tower Records and definitely was available from Allegro Imports the distributer of Nimbus discs here in the US. I bought a promotional copy at a store here in Los Angeles. Perhaps, it was never released in Britain?